Theresa Fowler meets Manchester's premier dance heroes 808 State. SO GUYS, WHEN DID YOU BUY YOUR 808? "Well actually, we never owned one," blurts Martin in his distinctive Mancunian accent. In fact, they use a 909, along with Roland's latest drum machine, the R8: "The 909 gives a good solid bass while the R8 adds sophistication. The sounds on the R8 are too nice, and it. tends to be weak on its own." Graham: "Basically, we are making music for dance floors." "It's because we are funky people," says Darren. "We like to make music for people to dance to." "Yeah, it's a strange thing about Manchester...there are a lot of white black people," says Graham. The boys do their funky homework by road testing tracks at Darren and Andrew's weekly DJ nights...The final release of Pacific State was the result of 12 months dance floor research. Martin: "We get our inspiration from anywhere. In order to make this type of music, you've got to have a good groove...because I buy records and sell them for a living, I just know what the elements are, and what people are looking for...what will make them dance." "We're giving samples away," says Graham. "I mean, if someone hears something good we've done, we're almost saying 'here, have it'. But to an extent...you have to have respect. You can tell when it's not used with integrity. We're not butchers when it comes to sampling." 808 use a technique they call "shadowing" - recording a song using a loop sample, then taking the original sample out, leaving something different. Graham: "It's a good way to work.. a lot of songs on our new album are ripped off from the track before!" The band are avid fans of Roland gear, "cos we like the Roland corporate image," says Martin. At the helm is a D50, a hired Minimoog and an SH101, the keyboard that they use on every track, the sequencer firing off the 909. Last, but not least, there's a Casio FZ1 sampler, simply because "It was available. We'll use anything - if we can learn something, there's a thrill in it...Sometimes we get good things purely out of incompetence," adds Graham. 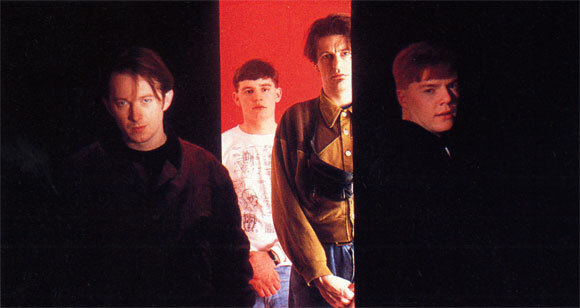 Ninety, the ZTT debut, was recorded over the past year on multitrack in a 16-track studio at the School of Sound Recording. The album took six days to mix. "What we're going to do next is investigate a mini recording studio for us, a 16-track. Something like we used at the Recording School, but that we'll have main access to. We've listened to some digital, but we've decided to stay with tape," says Martin. "That would be better for us, because a lot of the music is composed in 1/4" edits, not on the multitrack at all ..."